South Carolina folks will find any reason to celebrate, which is probably why you will find a festival for pretty much anything—music, food, art, charity, health, even horror films. Hot or cold, rain or shine, South Carolina festivals give locals and visitors plenty to do all year long. Make sure you add these 15 best South Carolina festivals to your social calendar, you’ll be glad you did. Craft beer lovers, unite! The Carolina Brew HaHa one-day fall festival aims to bring attention to the craft beer community in the Anderson and Clemson areas, along with live music, tastings from local and national brewers, and other activities. The event has even attracted the interest of Travel Channel UK’s “Ale Trails,” so much so that host Olly Smith filmed a segment during last year’s festival. Spoleto is Charleston’s premiere presentation for the arts, where the best and brightest talents in music, theater, art, and dance come together in a stunning visual and audial showcase over the course of 17 days. Spoleto has been a cornerstone of the Charleston community for over 40 years, and has hosted such world-famous talents as Yo-Yo Ma, Joshua Bell, and the Emerson String Quartet. Each spring, crowds pack into churches, theatres, and outdoor spaces to watch an array of musical and theatrical performances from schools, theatre companies, and up-and-coming talents. For a full schedule of shows and times, visit their official website. Fall for Greenville has been named one of the top 20 festivals in the entire southeast, and once you go it’s easy to see why. Greenville’s culinary scene dominates this three-day fall festival. Sample food and drinks from over 40 area restaurants as you cruise up and down Greenville’s famed Main Street, while enjoying free live entertainment. They even have a play area for the kiddos, chock full of rides and activities. If you can’t muster up the funds (or the courage) to join the Mardi Gras festivities in New Orleans, Folly Gras makes an excellent second choice—maybe even better than the real thing! Complete with parade, street party, and plenty of drinks and entertainment to go around, Folly Gras’s weeklong celebration is one not to be missed. Oh, and don’t forget the beads! Spittoono is the pride and joy of the RPAA (Redneck Performing Arts Association). Derived from the classier Spoleto festival in Charleston, Spittoono is a weekend-long music festival held every August that turns beer drinking into a charitable cause. Local artisans, food vendors, and three days’ worth of live music attract the crowds, and every bit of the money from drink and t-shirt sales goes to benefit local charities. It’s a food and music festival unlike any other. Founded by singer/songwriter Edwin McCain and restaurant extraordinaire Carl Sobocinski, euphoria’s mission is simple: Bring people together through the love of food and drink while giving back to others. The four-day fall festival is filled with cooking demos, wine seminars, exquisite dinners, local tastings, and plenty of live music, spreading the love of Greenville’s culinary and art scenes to locals and tourists alike. 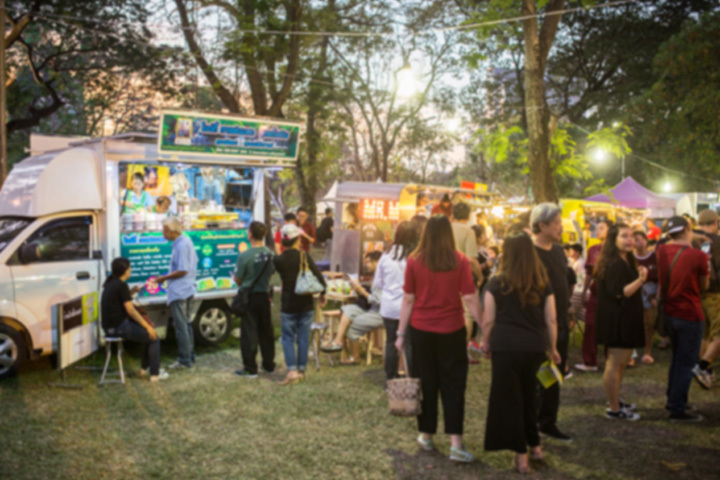 Surely you have seen food trucks at a festival before, but did you know those food trucks have an entire festival all to themselves? It’s true! And why shouldn’t they? Food trucks are the saving grace of every festival, big or small, and deserve a little recognition and appreciation. And there’s no better place for that than in beautiful Charleston, South Carolina. Food trucks normally exist to supplement the entertainment, but here they are the entertainment. You can find just about any kind of food imaginable (and even some your mind would never dream of!). Basically, all you need to know is: Come hungry. Okay, so this festival isn’t exclusive to South Carolina, but Columbia considers itself lucky to host such a crowd-pleasing event. Bubble Run combines the thrill of the footrace with a heaping amount of foam and bubbles to create a slippery, bubbly experience you aren’t likely to forget, even if you’re simply cheering from the sidelines. The folks at Bubble Run liken the event to a race through Willy Wonka’s factory, having participants run, walk, dance and play through three miles’ worth of whimsy. Cross the finish line and join the dance party, or take part in a variety of other activities. And if you don’t think you are athletic enough to enjoy it, no worries—it’s the most non-competitive “race” you can find. No prize for winning, no time limits, just good ole effervescent fun. If you want to join a festival that will get your engines revving, hop on the Harley and ride to Myrtle Beach’s Bike Week. Myrtle Beach is just one stop among many in a series of bike events leading from Florida on up the east coast. Vendors set up shop all along the Grand Strand, but a lot of the action happens down in Murrell’s Inlet. Nearly 300,000 people flood the area during the Spring Rally, sharing nothing more than the love of motorcycles. It’s loud, crazy, and somewhat dangerous, but that’s what’s kept folks cruising back every year since 1940. Strawberry picking, strawberry dessert-eating contests, and a pageant to crown the next Strawberry Queen, this multi-day festival is all about the strawberry. Aside from all the fruity fun, festival-goers can enjoy a car show, pig race, live entertainment, a pancake breakfast, butterfly exhibit, and plenty more activities for the whole family. It’s southern festival fun at its finest. What happens when you combine one of the south’s most prestigious cities with some of the finest flavors in the area? That should be a no-brainer: The Charleston Wine & Food festival is the premiere event of the city, showcasing the Lowcountry culinary skills and savoring of the city’s top chefs and food masters. This is the South Carolina festival destination for foodies to fill their bellies (and their Instagram accounts) with some of the best Southern edible creations imaginable. Make sure you get your tickets early before they disappear from the menu. Eighty thousand pounds of oysters. It sounds like a lot, but it’s just the right amount for the world’s biggest oyster festival. With beautiful historic Boone Hall as the backdrop, oysters abound in what the Southeastern Tourist Society deems one of the top 20 events in the southeast. Find out who’s the best at shucking or sipping oysters (yes, there’s an award for these things), or simply hang out and enjoy the live music while the kids burn some energy in the Children’s Area. If Charleston’s Horror Film Fest didn’t satisfy your cinema longings, perhaps the Charleston International Film Festival will do the trick. Showcasing the abilities of actors, directors, writers, and filmmakers from around the world, this festival reminds viewers that talent abounds outside the confines of Hollywood. Who could resist a sky painted in the vibrant colors of hot air balloons? Every October, dozens of hot air balloons dot the atmosphere over Anderson. For a small fee, visitors can climb aboard and soar through the clouds, taking in amazing views and snapping once-in-a-lifetime selfies. Or, if you prefer to stay on the ground, take time to enjoy carnival rides and games. And don’t forget to bring a picnic and enjoy the colorful scenery in the sky. View more South Carolina Festivals, Fairs and Parades.